According to Meteoritic Bulletin entry “Hocheppan” an H5 chondrite of 1.236 kg with mostly intact fusion crust was found in October 2016 on a hillside covered with scree below Gantkofel mountain in Northern Italy. The appearance of the meteorite as seen in pictures from the find location raised questions about the authenticity of the find. 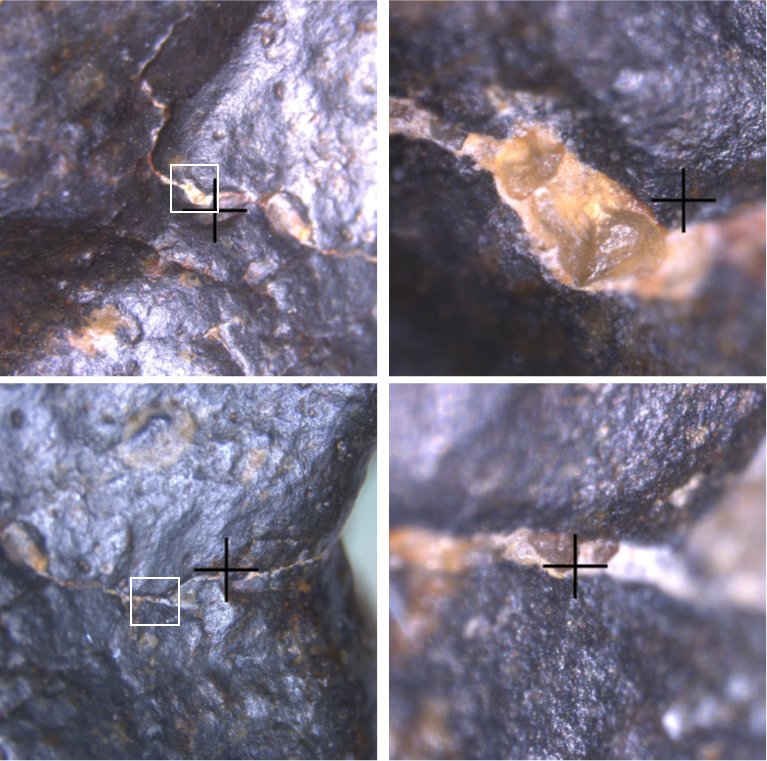 A forensic study by the author to address these questions included the thorough inspection of the find location, an extensive interview with the finder and detailed investigations of the meteorite features by XRF, Raman and microscopy. After all, the attempt to authenticate the find failed. The results of the study show consistently that the meteorite spent a major part of its terrestrial dwelling in a desert far from the find location. 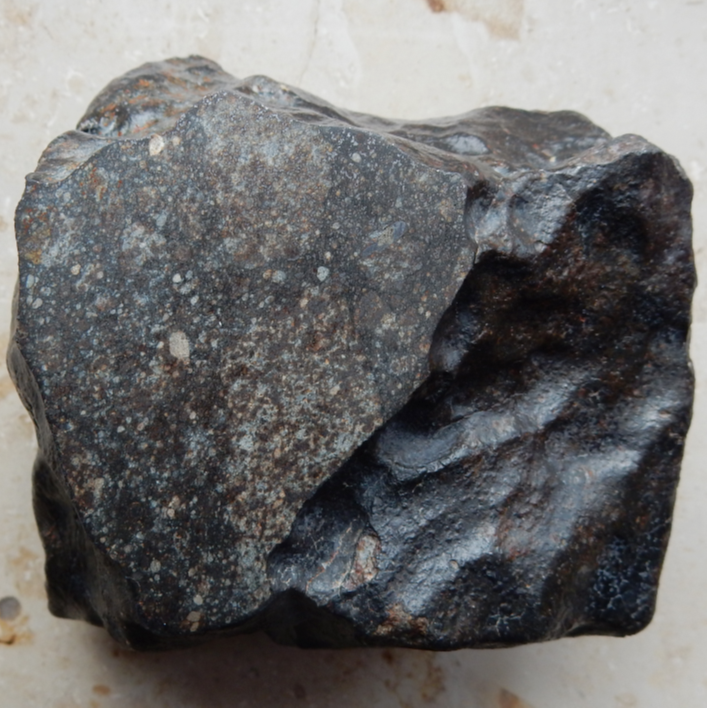 After classification and submission by Rainer Bartoschewitz (RB) the meteorite was approved in July 2017 and published in the Meteoritical Bulletin (https://www.lpi.usra.edu/meteor/metbull.php?code=65676). According to the writeup from MB106 it was found by Dieter Janek (DJ) from Eppan on a dolomitic hillside west of Bozen in Northern Italy on October 16, 2016 (to be corrected to October 15; acc. to communication by RB, November 14, 2017). On request of the finder it was named after the castle Hocheppan located at 2.5 km distance from the find place. The meteorite was an individual of 1.236 kg with mostly intact dark-brown fusion crust. Based on magnetic susceptibility, petrography and geochemistry it was classified as H chondrite of petrological type 5, shock stage 4, weathering grade W0/1. Motivated by RB the finder DJ agreed to a meeting during the Munich Show on October 28, 2017 in the backroom of DH’s meteorite meeting point “Meteoritentreff”. During an extensive interview of more than 2.5 hours DH and the author had the opportunity to scrutinize the finder’s meteoritic background and the circumstances of the “Hocheppan” find. The minutes of this interview by DH (in German) can be made accessible on request by DH or the author. DJ’s interest in meteorite falls goes back to 1975 when he observed a bluish-white light, a whistling noise and an impact-like sound in Sarntal. In late autumn 2014, while collecting mistletoes in the mountain area west of Eppan, he noticed a smoke trail accompanied by a loud noise which again he attributed to a meteoritic event. About 30 search hikes in the area yielded a number of meteowrongs. In the summer 2015 and in February 2016 DJ participated in organized tours through Morocco. He mentioned one (?) purchased meteorite from the Ouarzazate area in 2015 and three finds during a camel tour south of Zagora in 2016. From a private trip with his two friends in early 2017 he reports two more finds in the vicinity of Merzouga. A trip by himself to the area close to the Moroccan-Mauritanian border in summer 2017 ended in conflict with his local guides and without finds. Some more classifications are pending. On October 15, 2016 DJ undertook another mountain hike west of Eppan (Figure 1) together with two comrades. 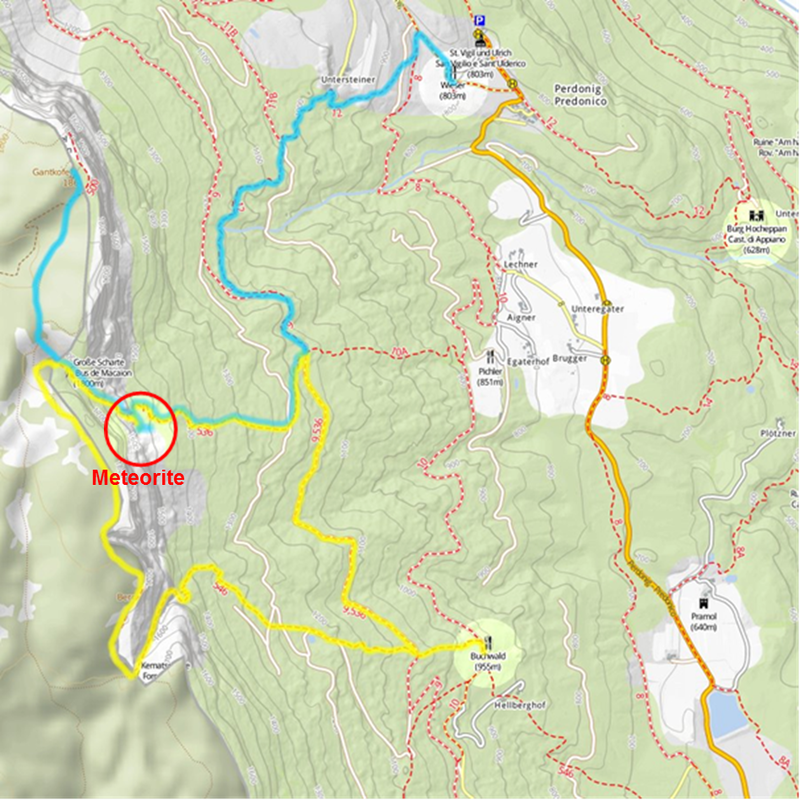 They started from Buchwald guest house around 10:30 and followed path 546 to the Kemat gap. During the passage of the plateau heading north towards Gantkofel mountain DJ, as usual, crisscrossed the trail in order to look for meteorites. When they reached Macaion gap the comrades immediately started downward path 536 while DJ took more time to look around. After soloing down the wire rope section through the gap he decided to search the forested slopes below the rock face. 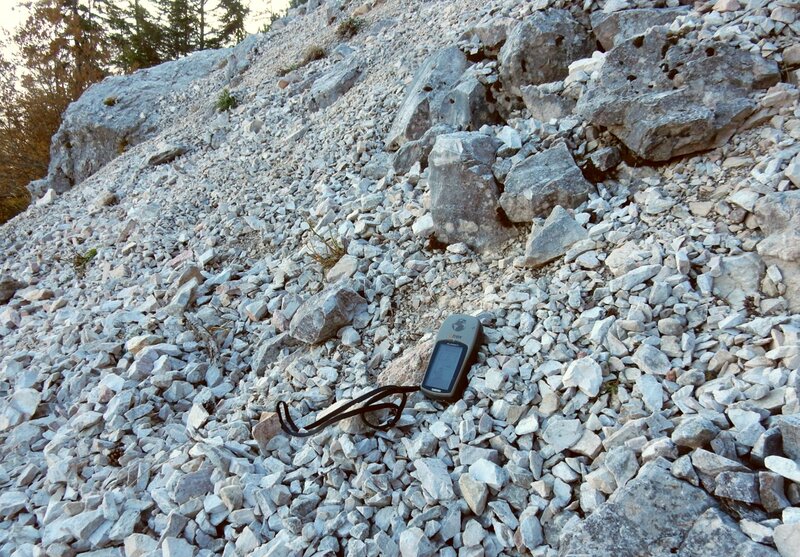 Following game trails to the south of the hiking trail through mountain pines and crossing an eroded gully he reached a steep scree slope, when in several meters distance he spotted the meteorite. After taking several in-situ photos DJ sent a first message to RB. Being back to the forest trail (?) he tried in vain to call RB. After another message sent to RB he continued his way downhill in order to reach Buchwald before darkness (local sunset: 18:29). DJ explained that in a first reasoning he had suspected his mountain friends to have played a trick in dropping the meteorite for him. One of these friends has died meanwhile; the other one has abandoned the friendship and is not available for testimony. In an attempt to authenticate the “Hocheppan” find the author decided to inspect the find location (Figures 1,2,3). The idea was to judge the find situation for plausibility, to look for traces like rusty contact points on the limestone bedding and to take samples for further analyses. The exposed scree slope extends from 1600 m directly at the foot of the east-facing rock wall down to 1470 m where it disappears in the forest. The inclination of its upper part was determined to be around 30°. As the find coordinates given in the Meteoritical Bulletin entry were not measured on-site but estimated from Google Earth, it took a while to identify the exact spot by comparison with the rock pattern visible in the in-situ photos (Figures 4 a,b). The time needed for documentation and sampling was used to take three sufficiently independent GPS records. The error of the average is estimated to be < 5m in all dimensions. As can be seen from the photos the exposed surfaces of the major stones are mostly darkened by weathering, indicating that this part of the slope is not subject to dramatic changes by annual weather. 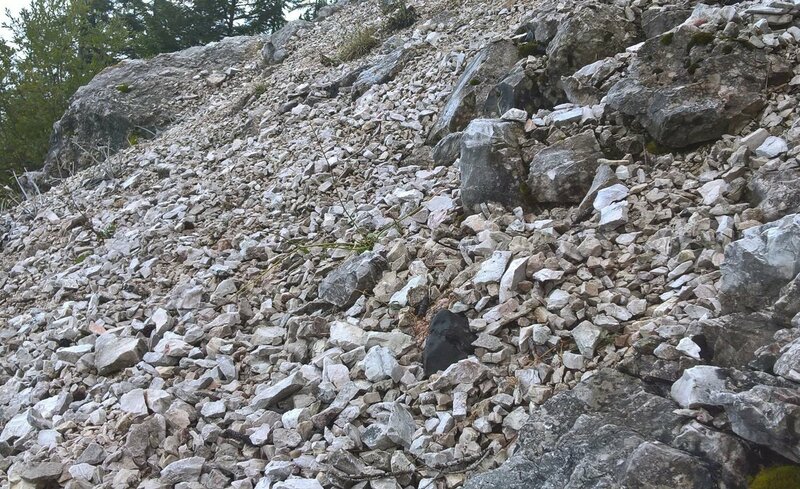 The more light-colored parts of the scree consist of smaller stones which may be moved by sliding snow or by crossing animals, or even make it there as fragments of stone falls from the rock face up to 200 m above. That means that a sizeable meteorite might reside there in a stable position for a few years at least. Landing there without damage would require winter conditions with enough dense snow to damp the impact and, after melting in spring time, to release the meteorite at its final position. This scenario is in remarkable detail what happened to the Neuschwanstein main mass (including the nomenclature after the nearby castle). The terrestrial age of “Hocheppan” was determined to be > 10 years (communication RB). Keeping in mind that this is the lowest limit, it appears not very likely that both the meteorite and the find constellation survived with that little alteration for such long time. It cannot be ruled out, however, due to the lack of a sufficient number of reference cases and without knowledge of the local history of severe weather events. 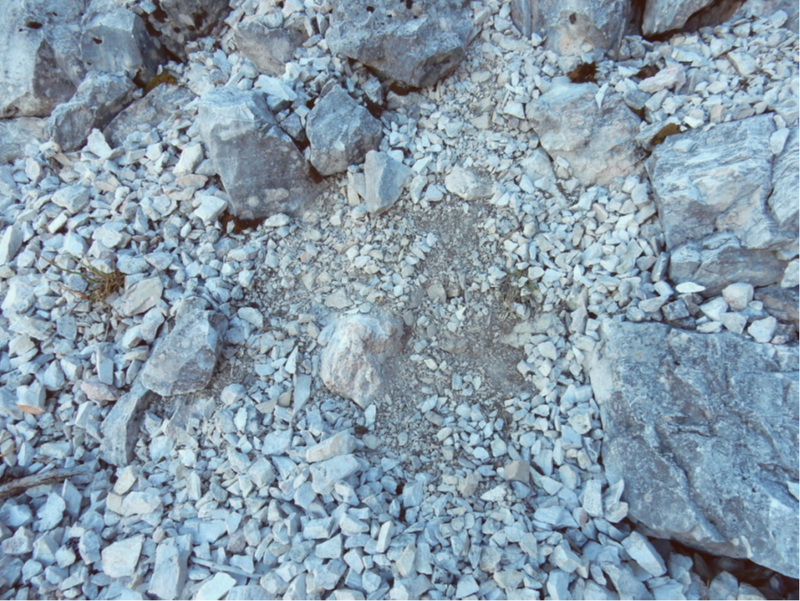 Therefore the find location was scrutinized for traces like contact marks on the limestone scree, which in the case of Neuschwanstein, an EL chondrite, were well-developed after 15 months in the mountain environment (Figure 5a). 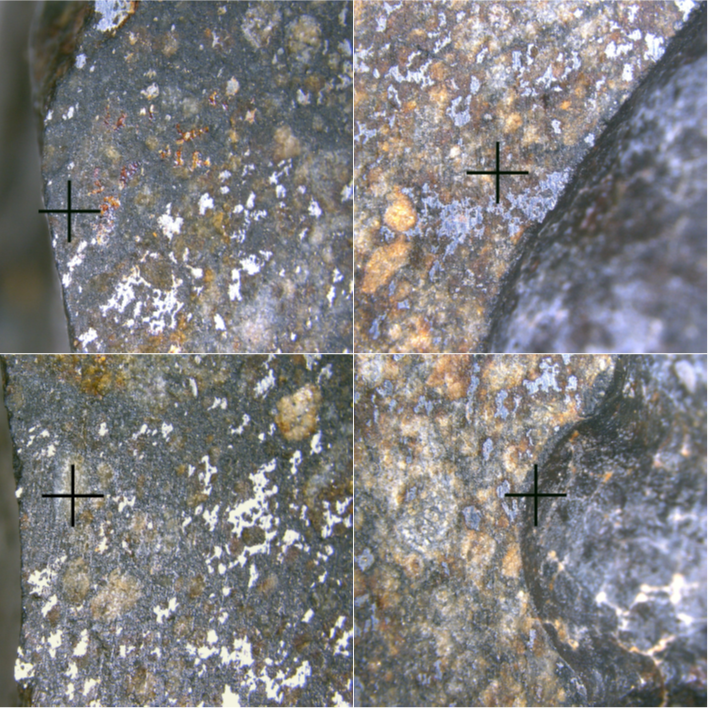 Few of the smaller stones surrounding the meteorite on the in-situ photos could be identified (Figure 5b), none of them displaced (downhill) by more than 30 cm. 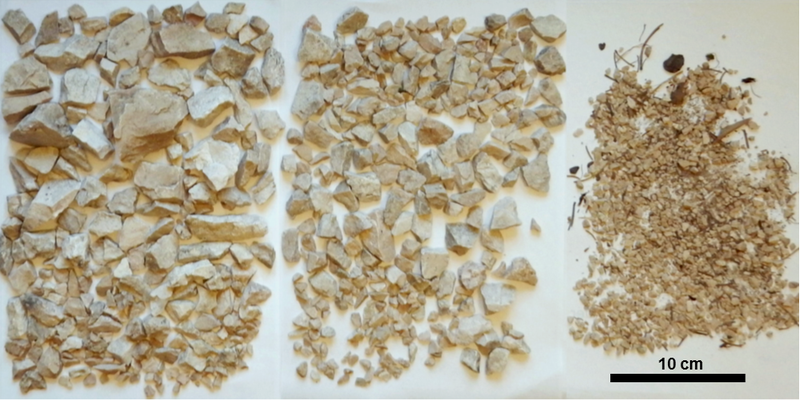 About 2 kg of material, representing most likely the former bedding, was taken home for detailed inspection (Figure 5c). Neither on-site nor in the lab there was any hint of rust traces which an H chondrite could have left. Reddish spots on a small embedded block (Figure 6) which obviously had supported the meteorite turned out to be inclusions, widespread in the dolomitic material. 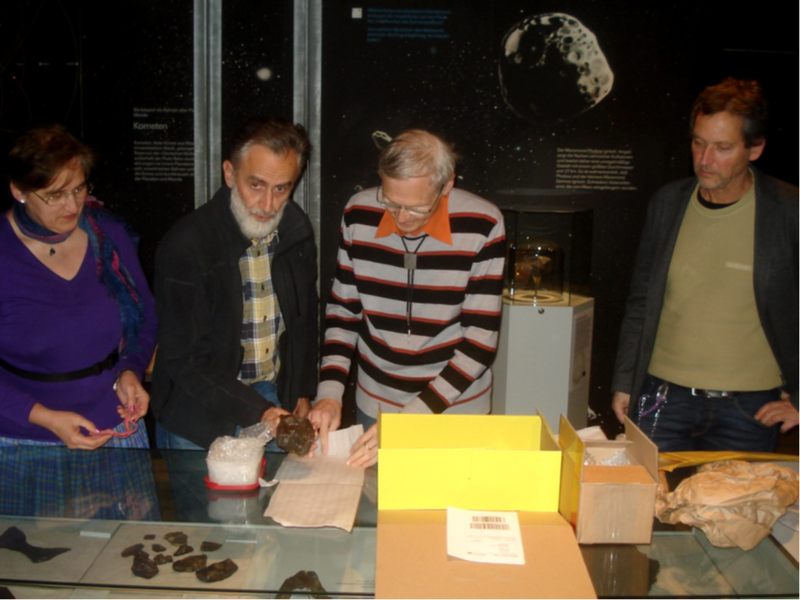 A small workshop organized in ZERIN (Zentrum für Rieskrater- und Impaktforschung Nördlingen) on occasion of the Paneth Colloquium 2017 gave the opportunity for some studies on meteorites and impact-related materials. A cut-off end-piece from “Hocheppan”, provided by RB, was subject to X-Ray Fluorescence spectroscopy (XRF) with a handheld device by BH. Among others the Strontium (Sr) and Barium (Ba) values were measured on a semiquantitative basis. While Ba measurement is somewhat delicate close to the detection limit, Sr can be determined in a most reproduceable way. Chondrites come with typical Sr values of 10±5 ppm when they arrive on Earth. Depending on the environment, the climatic situation and the time of residence this value will increase, starting on the surface and penetrating the volume with the length of exposure. Meteorites found in deserts may exhibit values up to more than 2000 ppm (see: Florian Zurfluh et al. in METEORITE, Vol. 18, No.1, Feb 2012, pp.34-38), in contrast to fresh falls or finds in Central Europe, which rarely exceed 20 ppm (e.g. in case of intense agricultural contamination). In case of “Hocheppan” the values of 48-62 ppm at the exterior are clearly elevated. 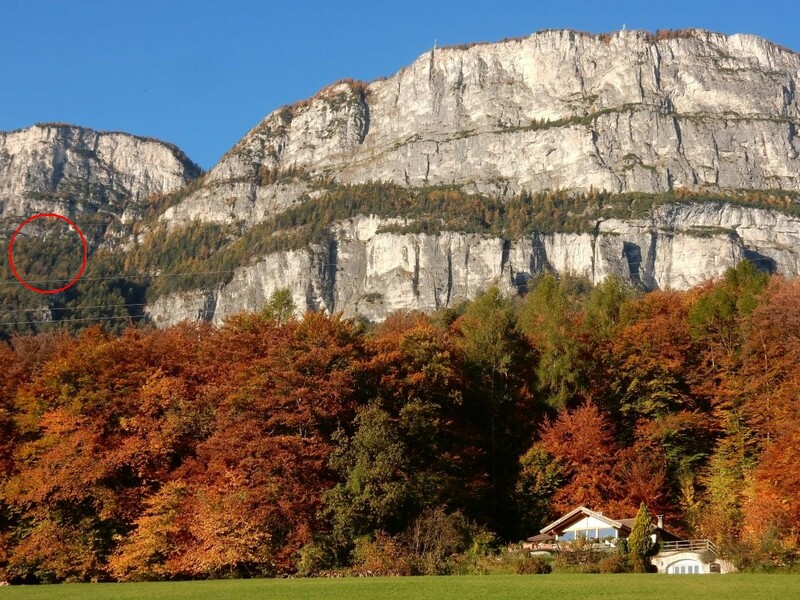 To clarify the potential influence of the alpine environment the measurements were extended to stones from the find places of both “Hocheppan” and Neuschwanstein (SB, BH). 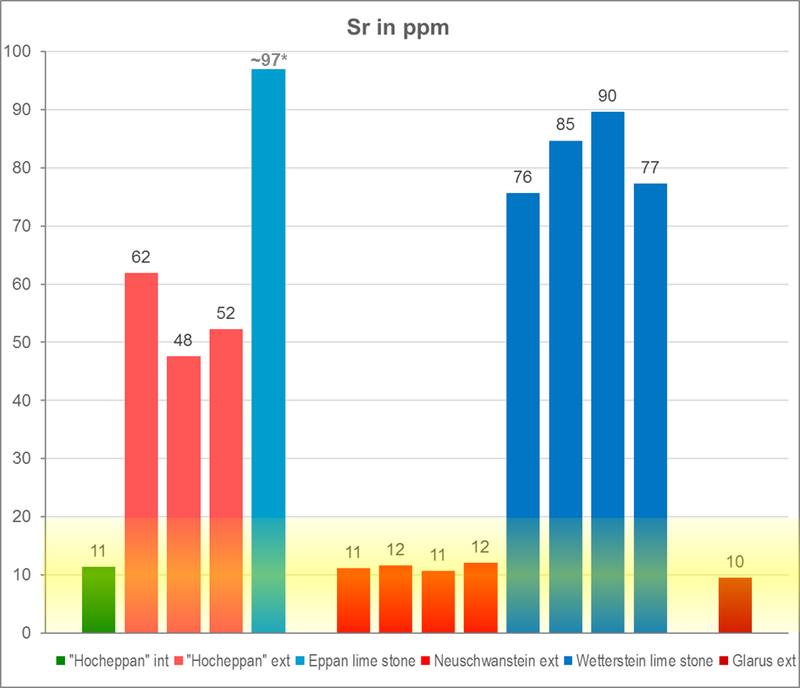 The resulting values are around 100 ppm (dolomitic and limestone material from Schlern and Contrin stratigraphic units) and 80 ppm (Wetterstein limestone), respectively, well above those of the meteorites (Figure 7). As Neuschwanstein shows not the slightest influence after 15 months it is at least questionable whether there exists a mechanism to transfer sufficient Sr to “Hocheppan” during a decade. Recently in Swiss Kanton Glarus a chondrite with terrestrial age >20 years was recovered from a similar environment, lying on top of limestone debris (communication BH, Dec 1, 2017). Like Neuschwanstein it shows no elevated Sr level, thus confirming the lack of an effective transfer mechanism in the alpine environment. In conclusion “Hocheppan” must have acquired its Sr (and Ba) contamination under desert conditions. What desert it came from cannot be determined unambiguously (Figure 8), but, considering all circumstances, the author’s best guess would be Sahara. Meteorites in hot deserts are subject to less weathering by oxidation than those found in rather wet areas. They are exposed, however, to wind erosion and agglomeration of tiny sand grains, clay particles and salty droplets. With the length of time the fusion crust will be polished, ultimately removed and replaced by a thin dark brown to black layer called “desert varnish”. Whether biological processes contribute to that is still under dispute. Major parts of the “Hocheppan” meteorite surface appear to be polished, which by most experts involved was interpreted as a clear indication of its origin from a desert. In some spots bare chondrules and metal flakes are emerging from the crust making the progressed degree of erosion obvious. In fact, except at the bottom of some regmaglypts, there is only a thin remainder of the fusion crust left (Figure 9). Theoretically one might raise the question about the erosive potential during mountain exposure, but interestingly the least shiny portion of the meteorite is exactly the one which is most exposed on the in-situ pictures. Additional traces from the desert were expected to be found under the microscope. Especially in areas enriched in salts, meteorites tend to develop encrustations which also may contribute to the filling of contraction fissures. Scrutinizing the surface of “Hocheppan” the author found several fillings which contained sand grains with diameters up to ~0.1 mm (Figure 10). 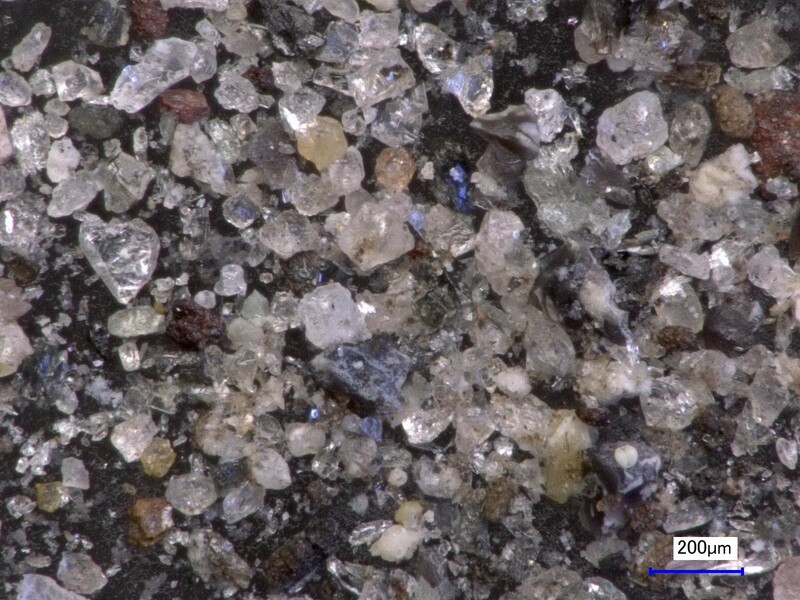 Raman spectroscopy performed by VH (private communication Dec 2017) on two grains identified them as quartz sand, confirming RH’s judgement from the visual appearance. 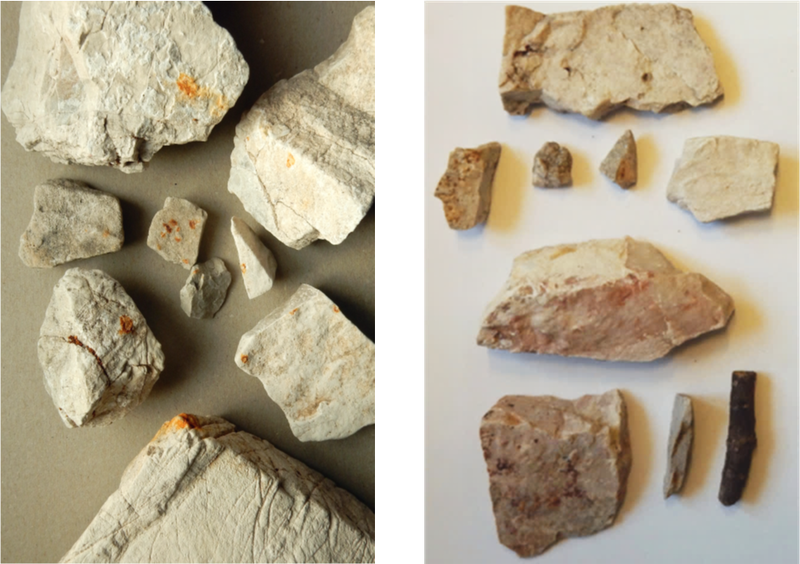 All handpicked samples of the similar looking grains from the fine fraction of the meteorite bedding (Figure 11), consisted of lime stone and dolomitic material matching the local geology of the “Hocheppan” find location. This is not in contradiction to the result of an exsolution test by BH which extracted a small portion of quartz and mica grains from the limestone sediment (Figure 12). This kind of grains is omnipresent due to glacial deposition and wind transport. Few of them resemble those found at the meteorite. However, by number and due to the lack of an effective deposition mechanism into the fractures they offer no plausible explanation for the findings on the meteorite. More general investigations of the meteorite include the measurement of the magnetic susceptibility by the author. The value of log χ (10-⁹ m³/kg) = 5.34 reported to the Meteoritical Bulletin by RB was reproduced precisely. Noble gas isotope analysis, initiated by RB, was performed in parallel to this study (communication RB January 13, 2018). The results presented were claimed to be in contradiction to a desert origin of the meteorite. This interpretation, however, failed a statistical countercheck. Some of the above investigations were possible because by the end of the Munich interview, DJ had offered to leave the meteorite with the author until early 2018 for further clarification. In the following days he changed his mind and asked for a timely restitution. On November 10, 2017 DH and the author met in Noerdlingen to arrange for the safe return consignment (Figure 13). DJ was informed of the final outcome of the study on November 11, 2017. He confirmed the proper receipt of his meteorite on November 16, 2017, and expressed his intention to involve scientists from abroad in some future analysis, hoping for more favourable results. The meteorite’s eroded appearance with blank metal spots is a strong indication of a long residence time in an environment with desert conditions; it is not compatible with a longer exposure to Middle European mountain climate. The Strontium contamination and the quartz grains in fissure fillings are in full accordance with a provenance from a desert like Sahara. The question how the meteorite made its way from there to the Eppan mountains can remain unanswered. The Meteoritical Bulletin entry should be revised accordingly. It should be emphasized that there is a whole tool box of elaborate methods to deal with the doubtful provenance of meteorites. In most cases a set of basic, forensic investigations is sufficient for an assessment, as demonstrated above. This study is in the tradition of similar investigations questioning doubtful finds, e.g. Folco et al. , Verish  and others; their merits for the hygiene of the meteorite record should be emphasized. The cooperation of all involved experts is greatly acknowledged. The finder’s agreement to participate in the extensive interview and to a temporary cession of the meteorite was quite helpful and is recognized. All images and graphs are by the author unless stated otherwise. Fig. 1: Eppan mountain area with “Hocheppan” find location (left), Hocheppan castle (right) and hiking trails. a) Wetterstein limestone with rust spots from 15 months of contact with the Neuschwanstein main mass. b) Dolomite and limestone, selected samples, some recognized from the “Hocheppan” in-situ photo: no traces of rust transferred from the meteorite. c) Stones likely representing the “Hocheppan” meteorite bedding: no rust. Fig. 6: The find place after some excavation. 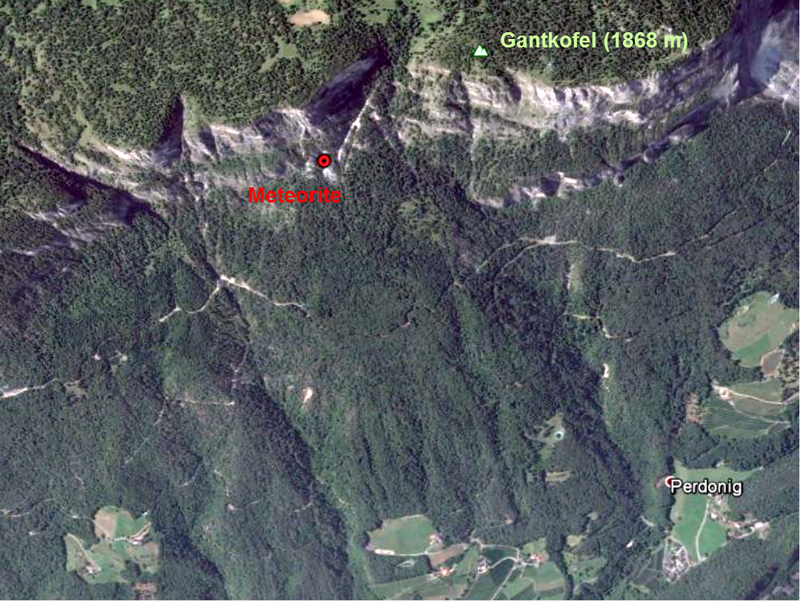 The dolomitic rock in the center acted as direct support of the meteorite according to the in-situ photo. The reddish spots are no contact marks, but natural inclusions. yellow: range of meteorites from fresh falls or Middle European finds (rarely > 20 ppm). Fig. 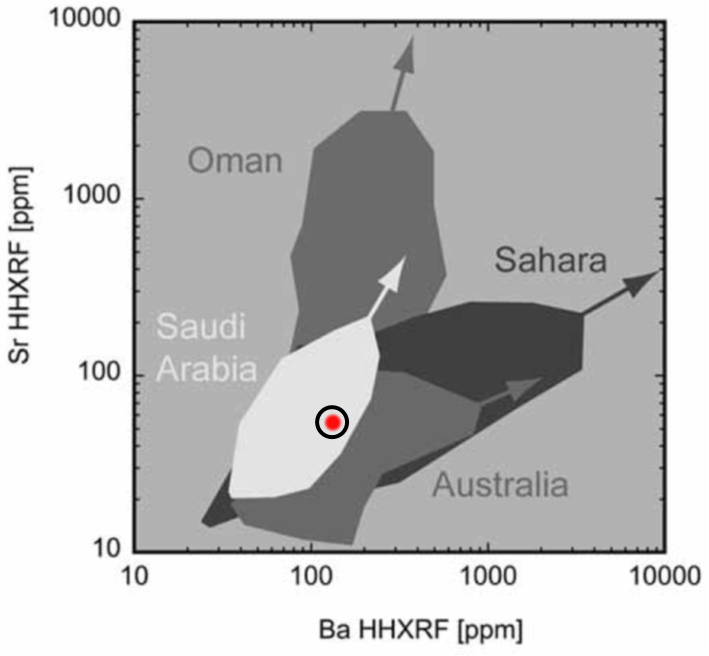 8: Plot of Barium and Strontium values of the “Hocheppan” surface (red dot) vs. typical ranges for various deserts. © Florian Zurfluh et al. (METEORITE, Vol. 18, No.1, Feb 2012, p.37). Fig. 9: Different degrees of erosion at the “Hocheppan” fusion crust are found along the edge of the cut endface: some remnants of crust have survived at the bottom of regmaglypts (right), almost no crust is left on more exposed convex portions (left). Fig. 10: Sand grains cemented in contraction fissures in the “Hocheppan” crust; width of the images represents 8 mm (left) and 1 mm (right), respectively. Fig. 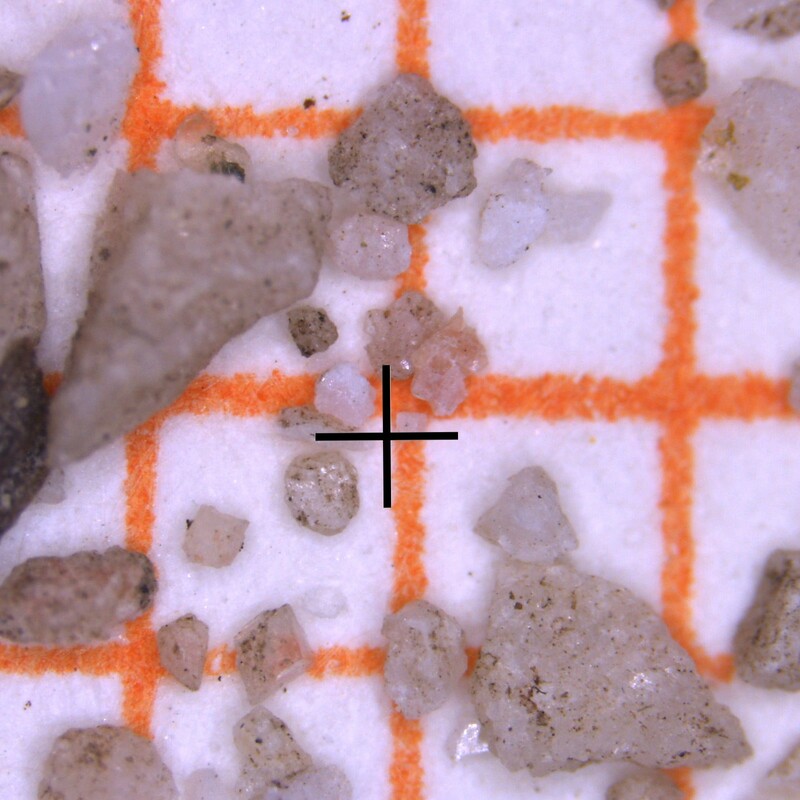 11: Grains from the fine fraction of the “Hocheppan” stone bedding: all hand picked samples were limestone, despite a small admixture of omnipresent quartz grains should be expected; width of the image represents 1.5 mm. Fig. 12: Grains as residue of an acidic exsolution test from the fine fraction. 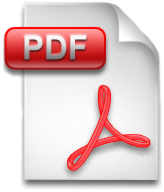 Further research, contributions or replies concerning this issue which we might be provided with in the future could be published or linked to here if they meet adequate scientific standards. We welcome your relevant contributions!